Northampton based actress Sue Wallace is looking forward to having some time at home with her new show. She appears in the Royal & Derngate’s production of A Tale of Two Cities which runs from Saturday September 10 to Saturday September 17. Sue said: “It’s a well known story by Dickens and is his favourite story. It’s a very dramatic and different to the things he had written before. “It’s very much about two different places. England having had its revolution whereas the revolution in France which is in full swing. “My character is Miss Poss, a very nice lady who has helped to bring up Lucy. Essentially it is a love story.But there are so many themes within it. “I’m like her mother, her teacher and friend. I’m now the housekeeper. “The other levels are is that it is about justice, honour and people from being reclaimed not just from prison but from themselves. 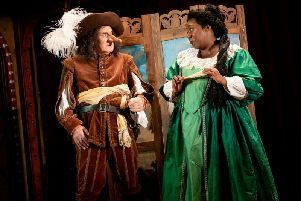 It is the second time that A Tale of Two Cities has been performed at the Royal and Derngate and it was this production that Sue is very familiar with. She added: “I was fortunate to see it two years ago and thought it was really great. I live in Northampton and have been desperate to work with James Dacre, who did it originally, since seeing it. I;ve seen more or less every piece he has done. “Because he’s got more time, he;s changing and developing in new ways and exciting. “James wants to look at the themes of justice and how they are relevant today. There were sham courts, sham prisons like Guantanamo Bay, it’s not a million miles away from the Bastille. He’s feed in the threads of the modern ideas which are relevant now. “James is very keen to create in the audience’s mind that these are characters which are not dissimilar to what is going on in the world today. So for someone well versed in the original text and having seen the previous production, there are a few unexpected challenges. Sue said: “I have to have a fight scene. I’ve only got an umbrella and fighting someone with weapons. I’ve been shot and killed on occasions but have never had a fight. We’ve worked a bit on it, the more practice. “It’s mismatched. Dickens as well as our writer, it should have a slight comic element and makes the final scene a lot more poignant. “I thought we would be playing it for laughs but it will only work if we play it for real. That is true of many things that are comic in the theatre. The humour comes out of people taking it seriously. “We are working hard on the big trial scenes at the moment which are tricky. The first one takes place at The Old Bailey and like to think that will be the British sense of justice being done. The other challenge element to rehearsals is the weather. During our chat, there is a heatwave and one that is causing an unexpected problem. Sue said: “It’s difficult rehearsing it because it so hot and there is a sense in the show that we are in a horrible part of France and it is really cold. Hard to keep that going. James has to remind us that is cold. She’s a regular face on television but Sue says that she prefers working on the stage. Sue added: “It’s always preferable to do the stage. It’s great doing tele and radio and film. I like doing it because every night is different and the audience becomes another member of the cast in that they can change how the evening progresses. I’ve always found that’s the buzz that people get. “I’ve just done nine months at the National and Manchester and is different in different parts of the country so going on tour is really interesting because you know people will take it in a different way. And it is clear that she has a huge passion for Northampton stemming back from her previous appearence at the venue. Sue said: “I did Hedda Gabbler when Laurie Sansom was the artistic director. I lived here 28 years and I said I wouldn’t move anywhere unless it had a theatre. It was the perfect place. Perhaps one day I’ll work there and it is only the second time in 28 years so you find yourself always travelling. If she is known for one thing then it is working with the late Victoria Wood. It’s a difficult conversation, not due to any reluctance on her part to talk about the talented comedian, but simply that even months after her death, it clearly upsets Sue. She said: “It’s a hard thing this for me because I’ve always talked about her in interviews and I love working with her. And known her for 40 years so it’s been a very hard knock to loose her. “It came out of nowhere for most of us. Like Alan Rickman who I also knew. Because she had kept it quiet, it was her way. She was a very private person. And she is incredibly grateful for the work that Victoria gave Sue over the years. Suue said: “I feel so bereft because she gave lots of people breaks. I met her when I was doing pub theatre in Birmingham. “She’s one of those people who remember’s other people. I didn’t get into one of her shows, but she remembered me and got into her next show and then got into lots of her television shows, dinnerladies and Housewive 49. “The last time I saw her was when she was in the Lake District and she has a place up there and came to see the show and was talking about all her plans for the future. “She didn’t want people worrying about her. Her legacy, was that someone was watching her show and remarking on it and I said that was her legacy and she would want people to remember how funny she was. Tickets priced from £10 to £29 and can be booked by calling the box office on 01604 624811 or online at www.royalandderngate.co.uk.